HONG KONG — The banners and posters were quietly hung in universities across Hong Kong, often appearing overnight, with bold white lettering calling out for change and testing the limits of the freedoms that Beijing will allow this freewheeling city. "Hong Kong Independence!" one banner declared. "Fight for Our Homeland!" said another. 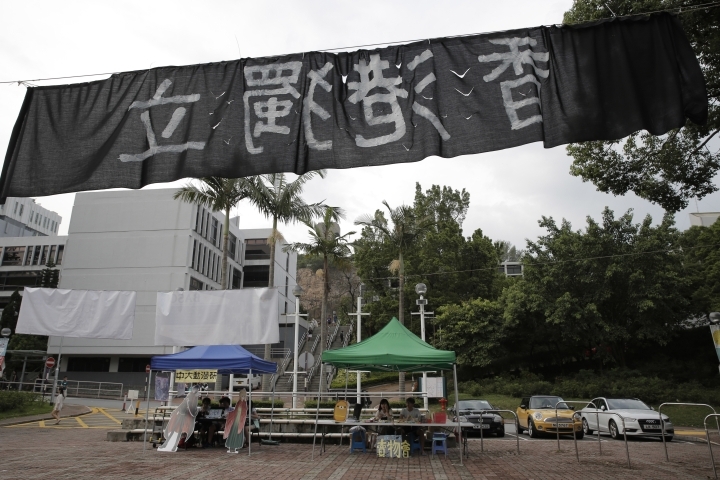 To students from Hong Kong, the banners were a defiant insistence that their city is different from the rest of China, and that they can express themselves in ways unimaginable on the mainland. But to many mainland students, the calls for independence were unpatriotic insults. Some pushed back in anger, ripping them from university bulletin boards and setting off shouting matches caught on videos that spread quickly on Chinese social media, exposing the widening gulf between Hong Kong and the mainland, which rules this former British colony. The series of September clashes over the banners not only rekindled a debate over Hong King's relative rights to free speech and protest — freedoms unseen on the mainland — they have also revealed deeper tensions between students from the city and those from the mainland. 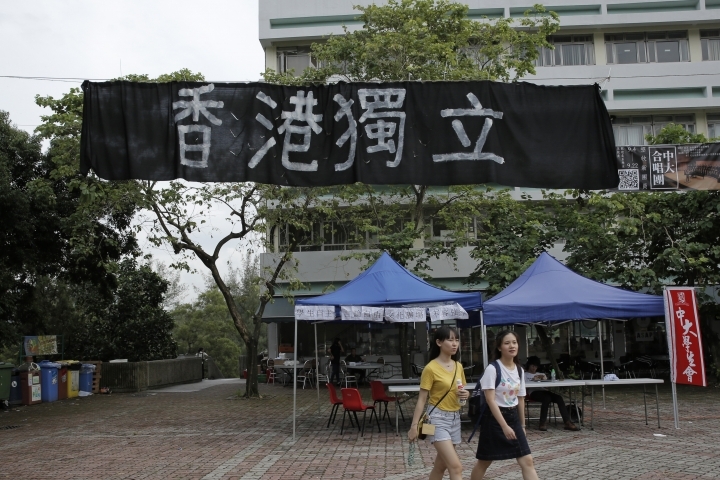 The issues are exacerbated by anxieties among Hong Kong's youth over a perceived loss of job prospects to their mainland peers and the chilling effect the ruling Community Party has on campus discourse. The student spat is one part of broader tensions surrounding Beijing's relationship with Hong Kong as the city undergoes an increasingly tense 50-year transition to Chinese rule. Beijing created a special status known as "one country, two systems" for Hong Kong following its 1997 handover from Britain to mainland China, giving it wide autonomy and civil liberties. At the city's universities, student union bulletin boards called "Democracy Walls" became filled with politics, polemics and youthful anger. In the years since then, increasing numbers of mainland students have come to the city to study, laying the groundwork for tensions. In the last academic year, mainland students made up 76 percent of international students in public university programs, according to the government. Although there is a cap on undergraduate admissions of mainland students, the number of Chinese postgraduate students has doubled in the last decade, making them a much more visible presence on campuses. "Hong Kong students think that mainland students are taking their learning opportunities and degrees from them," said Chris Chan, an economics student at Hong Kong Baptist University. Many locals like Chan fear that large companies and banks are more likely to hire mainland Chinese graduates, since Hong Kongers often don't have as many connections to the mainland-dominated business community. This anxiety over job prospects stems from deeper, systemic problems about skyrocketing rents and high costs of living. The influx of mainland Chinese has contributed to soaring housing prices in a city where a parking spot can now fetch up to $664,000, placing middle-class families and younger residents under intense financial pressure. Many young people believe that in contrast to their parents' generation, "we do not have any upward social mobility," Chan said. The failures of the 2014 Occupy Central protests, which demanded Hong Kong's right to elect its own leader, resulted in further disillusionment among young people. The growing worries over the political and economic future of the city have fueled a deep resentment among many Hong Kong students, with some derisively referring to mainlanders as "locusts," for their voracious buying of luxury goods, apartments and even baby formula. It has also made more young people anxious for a separate Hong Kong identity. The proportion of 18-19 year-olds who describe their ethnic identity as "Chinese" has fallen from 32 percent in 1997 to just 3 percent this year. These divisions are exacerbated by language, with Mandarin dominating in mainland China and Cantonese in Hong Kong. For some Hong Kong youth, simply hearing someone speak Mandarin can be infuriating. As a result, said Howard Liu, a student at Hong Kong Baptist University, many of his fellow mainlanders rarely get to know local young people, choosing to socialize among themselves. "Their main focus is to get through university, study hard and get a good job," he said. But it's not just Hong Kong's young people who worry about politics. Many mainland students, accustomed to a culture where political protest is very rare, are too afraid to even get involved in the divide. "Mainland students tend to stay away from getting involved with politics," said Ming Li, a lecturer at the Chinese University of Hong Kong. "They've been taught to keep quiet about political issues." One person who spoke against the grain was Tang Lipei, a 24-year-old mainland student studying at the Chinese University of Hong Kong. When Tang went on the Chinese social networking site Weibo to criticize another mainlander for tearing down independence posters, he was attacked by a flood of patriotic mainlanders and the state-run newspaper Global Times, which criticized what it called his "chilling behavior." A week later, he issued an online apology, affirming his "deep affection for the country I was born and raised in." The student who ripped down the poster, meanwhile, was praised by Beijing's state media and the Communist Youth League. It's a situation that often leaves mainland students in a no-win situation. "Radical pro-independence students will perceive them instantly as colonizers and fiery nationalists back home perceive them as traitors to their race," said Li. For these students, the best course of action is often silence, no matter what they believe. Because as Li explains, quoting a Chinese proverb, "The shot will only hit the bird that pokes its head out."